The Seattle General Strike of 1919 was a five-day general work stoppage by more than 65,000 workers in the city of Seattle, Washington, which lasted from February 6 to February 11 of that year. Dissatisfied workers in several unions began the strike to gain higher wages after two years of World War I wage controls. Most other local unions, including members of the American Federation of Labor (AFL) and the Industrial Workers of the World (IWW), joined the walkout. Although the strike was non-violent and lasted less than a week, government officials, the press, and much of the public viewed the strike as a radical attempt to subvert American institutions. Some commentators raised alarm by calling it the work of Bolsheviks and other radicals inspired by "un-American" ideologies, making it the first concentrated eruption of the anti-left hysteria that characterized the Red Scare of 1919 and 1920. The ' Wobblies' (IWW) joined the general strike and advocated for One Big Union. In these years, more workers in the city were organized in unions than ever before. There was a 400 percent increase in union membership from 1915 to 1918. At the time, workers in the United States, particularly in the Pacific Northwest, were becoming increasingly radicalized, with many in the rank and file supportive of the recent revolution in Russia and working toward a similar revolution in the United States. In the fall of 1919, for instance, Seattle longshoremen refused to load arms destined for the anti-Bolshevik White Army in Russia and attacked those who attempted to load them. The arrival of the Shilka arriving in Seattle on December 24, 1917 added to the thought of Bolshevik involvement. The ship had been damaged and thrown off course in a storm and limped its way into the port almost out of fuel, food and fresh water. The U.S. Attorney in Seattle was tipped off by an "informant" that the ship was coming and it was going to "aid the enemy." The enemy at this time would have been the labor parties threatening a strike. Many believed that its arrival signified a Bolshevik connection with the labor unrest in Seattle. A lot of rumors came about because of this ship's arrival. The Seattle Post-Intellegencer ran a front-page article about an I.W.W. ship being held that contained over 100 thousand dollars to go to help the I.W.W. members get out of jail. This article proved to be false as the search of the vessel by local law enforcement turned up nothing of significance. A first-hand account of a sailor aboard the ship claimed that there was no evidence found on board because the only evidence was some flyers in a briefcase that were carried off of the ship upon its arrival. Another passenger that arrived with the ship was arrested for taking part in labor talks with one of the unions in the area. Although there was never any concrete evidence connecting the Shilka to the labor parties of Seattle, there was enough to show that the labor parties at the least had the support of Bolshevik Russia. There was a lot of fear of the Bolsheviks because it was known that they had been hoping for a revolution in the Western World in order to help support the poor Russian ways by pooling resources together. The ship spent about a month in port before it was allowed to leave and never heard of or seen again in the Seattle area. I believe that 95 percent of us agree that the workers should control the industries. Nearly all of us agree on that but very strenuously disagree on the method. Some of us think we can get control through the Cooperative movement, some of us think through political action, and others think through industrial action. For some time these pamphlets were seen by hundreds on Seattle's streetcars and ferries, read by men of the shipyards on their way to work. Seattle's businessmen commented on the phenomenon sourly; it was plain to everyone that these workers were conscientiously and energetically studying how to organize their coming to power. Already, workers in Seattle talked about "workers' power" as a practical policy for the not far distant future. Seattle shipyard workers leave the shipyard after going on strike, 1919. A few weeks after the November 1918 armistice ended World War I, unions in Seattle's shipbuilding industry demanded a pay increase for unskilled workers. In an attempt to divide the ranks of the union, the yard owners responded by offering a pay increase only to skilled workers. The union rejected that offer and Seattle's 35,000 shipyard workers went on strike on January 21, 1919. Controversy erupted when Charles Piez, head of the Emergency Fleet Corporation (EFC), an enterprise created by the federal government as a wartime measure and the largest employer in the industry, sent a telegram to the yard owners threatening to withdraw their contracts if any increase in wages were granted. The message intended for the Metal Trades Association, the owners, was accidentally delivered to the Metal Trades Council, the union. The shipyard workers responded with anger directed at both their employers and the federal government which, through the EFC, seemed to be siding with corporate interests. A cooperative body made up of rank and file workers from all the striking locals were formed during the strike, called the General Strike Committee. It acted as a "virtual counter-government for the city." The committee organized to provide essential services for the people of Seattle during the work stoppage. For instance, garbage that would create a health hazard was collected, laundry workers continued to handle hospital laundry, and firemen remained on duty. Exemptions to the stoppage of labor had to be passed by the Strike Committee, and authorized vehicles bore signs to that effect. In general, work was not halted if doing so would endanger lives. In other cases, workers acted on their own initiative to create new institutions. Milk wagon drivers, after being denied the right by their employers to keep certain dairies open, established a distribution system of 35 neighborhood milk stations. A system of food distribution was also established, which throughout the strike committee distributed as many as 30,000 meals each day. Strikers paid twenty-five cents per meal, and the general public paid thirty-five cents. Beef stew, spaghetti, bread, and coffee were offered on an all-you-can-eat basis. Army veterans created an alternative to the police in order to maintain order. A group called the "Labor War Veteran's Guard" forbade the use of force and did not carry weapons, and used "persuasion only." Peacekeeping proved unnecessary. The regular police forces made no arrests in actions related to the strike, and general arrests dropped to less than half their normal number. Major General John F. Morrison, stationed in Seattle, claimed that he had never seen "a city so quiet and orderly." The methods of organization adopted by the striking workers bore resemblance to anarcho-syndicalism, perhaps reflecting the influence of the Industrial Workers of the World in the Pacific Northwest, though only a few striking locals were officially affiliated with the IWW. The pamphlet entitled "Russia Did It." Revolutionary pamphlets littered the streets of the city. One called "Russia Did It" proclaimed: "The Russians have shown you the way out. What are you going to do about it? You are doomed to wage slavery till you die unless you wake up, realize that you and the boss have nothing in common, that the employing class must be overthrown, and that you, the workers, must take over the control of your jobs, and through them, the control over your lives instead of offering yourself up to the masters as a sacrifice six days a week, so that they may coin profits out of your sweat and toil. Newspaper across the country reprinted excerpts from Strong's editorial. Police setting up a mounted machine gun during the strike. Three simultaneous movements brought the strike to an end. Mayor Hanson increased the police and military forces available to enforce order, though there was no disorder, and possibly to take the place of striking workers. Union officials, especially those more senior and those at higher levels of the labor movement, feared that using the general strike as a tactic would fail and set back their organizing efforts. Union members, perhaps seeing the strength of the forces arrayed against them, perhaps mindful of their union leaders concerns began to go back to work. The General Strike Committee attributed the end of the strike to pressure from international union officers and the difficulty of continuing to live in the shut-down city. Mayor Hanson had federal troops available and stationed 950 sailors and marines across the city by February 7. He added 600 men to the police force and hired 2,400 special deputies, students from the University of Washington for the most part. :87 On February 7, Mayor Hansen threatened to use 1,500 police and 1,500 troops to replace striking workers the next day, but the strikers assumed this was an empty threat and were proved correct. The Mayor continued his rhetorical attack on February 9, saying that the "sympathetic strike was called in the exact manner as was the revolution in Petrograd." Mayor Hansen told reporters that "any man who attempts to take over the control of the municipal government functions will be shot." The mayor's newly hired deputies receive their weapons. The city had been effectively paralyzed for five days, but the general strike collapsed as labor reconsidered its effectiveness under pressure from senior labor leaders and their own obvious failure to match the Mayor's propaganda in the war for public opinion. The shipyard strike, in support of which the general strike had been called, persisted. Immediately following the general strike's end, thirty-nine IWW members were arrested as "ringleaders of anarchy", despite their playing a marginal role in the development of events. 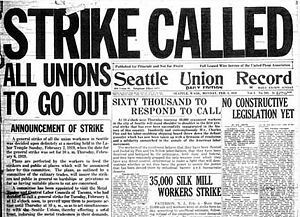 The so-called sympathetic Seattle strike was an attempted revolution. That there was no violence does not alter the fact... The intent, openly and covertly announced, was for the overthrow of the industrial system; here first, then everywhere... True, there were no flashing guns, no bombs, no killings. Revolution, I repeat, doesn't need violence. The general strike, as practised in Seattle, is of itself the weapon of revolution, all the more dangerous because quiet. To succeed, it must suspend everything; stop the entire life stream of a community... That is to say, it puts the government out of operation. And that is all there is to revolt–no matter how achieved. Between the strike's announcement and beginning, on February 4, the U.S. Senate voted to expand the work of its Overman Judiciary Subcommittee from investigating German spies to Bolshevik propaganda. The Committee launched a month of hearings on February 11, the day the strike collapsed. Its sensational report detailed Bolshevik atrocities and the threat of domestic agitators bent on revolution and the abolition of private property. The labor radicalism represented by the Seattle General Strike fit neatly into its conception of the threat American institutions faced. This page is based on the Wikipedia article Seattle General Strike; it is used under the Creative Commons Attribution-ShareAlike 3.0 Unported License (CC-BY-SA). You may redistribute it, verbatim or modified, providing that you comply with the terms of the CC-BY-SA.